While I have the CELL up and working fine on Raspberry Pi (great! ), I am having issues with the GPS or ACCEL chips when connected via solder in the ShieldRv1 (but only one at a time -- I realise the board and Raspberry Pi don't really support simultaneous operation). works fine to get commands/data to and from the CELL? Again, note only the GPS or ACCEL chip is connected at any one time. ACCEL: The accel uses SDA+SDL which is I2C not UART. 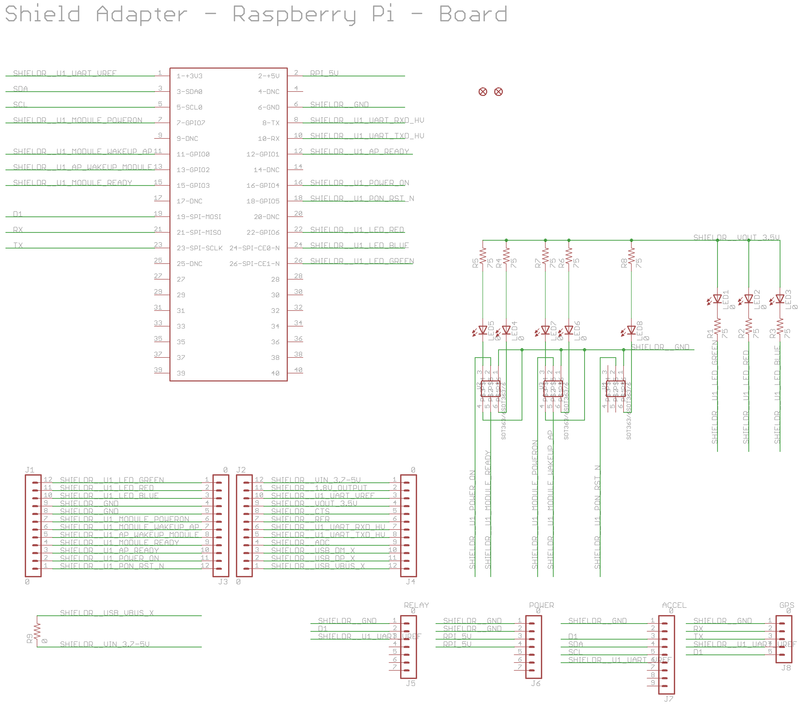 So you need to check out the RasPi's I2C capability. GPS: The GPS connects via "a" UART, not the main UART. If it were the main UART, it would collide with the CELLv1.0. The second UART needs to be connected via a software serial connection over the RasPi 19 and 21 with RX and TX respectively. "In addition, breakouts are provided for the four additional SparqEE boards (ACCELv1.0, GPSv1.0, POWERv1.0, RELAYv1.0) if the user prefers to directly connect any of those boards to the shield." However, your answer says that also a "software serial connection over the RasPi 19 and 21 with RX and TX" is required to make the GPS work. 1 detail how the "software serial connection over the RasPi 19 and 21 with RX and TX" can be carried out ? 2 upload to the product reference page the code which sets the "software serial connection" or at least state clearly that additional coding and knowledge is needed to connect the four additional boards. Pictures of the other boards connected to the shield would be also very welcome. In this way when we buy the shield we will know accurately what we need to do to make the additional boards work with the shield. There are several ways to connect into the PI and various configurations. The mounting holes were a request from kickstarter and are consistent with our other shields. The raspi only has one hw uart broken out. Anything custom is up to the user to implement. Thanks anyway for the clarifications. Nope. You need to use a SW serial implementation if you want to use a 2nd UART. You can still use everything else, just like a standard shield adapter. The side metal pins in the shield have the same role as the pins found in r-pi. the two black rows of connectors in the central part of the shield are only to connect Cellv1 and nothing else. the mounting holes are for other boards but in order to use them we need more than 1 UART and thus a "serial software" solution. Nope. Shields are not meant to use all the I/O pins of the underlying boards, some of them but not all of them. The metal holes for other SparqEE breakout boards just re-route those same I/Os from the underlying boards. You must look at the schematic diagram to figure out which I/Os are used by the CELLv1.0 and which ones are available to be used for other services. You can always schedule the use of the UART for different functionalities at different times... like use the cellular communication for a minute, then use it for the GPS module, or something like that. Depending on your implementation. There is only one HW UART on a RasPi. The GPS board is the only board of SparqEE's, other than the CELLv1.0 that uses a UART to communicate. I just want to do something very simple: I want to connect GPSv1 to the ShieldRv1 and get the gps data through r-pi /dev/ttyAMA0 as the user who started this thread explained. I don't plan to connect any other device to the shield, just the GPS. I have jumper wires and a breadboard and I looked at the schematics but It is not clear to me how to do the connections. I must confess that I only have a basic knowledge of circuit theory so I might be missing something elementary. Is there a simple way of doing what I am asking or is more advanced knowledge needed ? I was thinking about the solution of tying both to the same UART, and I don't think that's a good idea. It might work, but there is no way, without shutting one or the other off, when communicating with the other. For a GPS read-only device, connecting to a GPIO port and doing a bit-bang solution is the best option. This is really out of our scope, but a few people have asked about it and it interests me so I'll look into it... FYI sooner than later, here's a post that I'll be testing out. If you get a chance to attack it before I do, please post up your results. This code is meant to get you a "bit-banged" GPS NMEA data (or any serial) over GPIO.